PokerStars Mobile Casino Review -- Harmonious Table Games and Slots! PokerStars casino offers mobile slots and casino games — a brilliant combination of gambling types! Check PokerStars Casino Out Now! Many casinos share table games with video slots among their repertoire. But only few manage to maintain a healthy balance between the two. PokerStars mobile casino strikes that balance perfectly. It's a concise yet abundant operator that provides sports, table games as well as slots to keep players occupied. There are, of course, two options you can make use of — the instant play or the downloadable version of this site. For the sake of ease, we'll be talking about the instant play but may make reference to the downloadable content in this review. If you love having your varying forms of gambling in one place, PokerStars is the mobile casino for you. 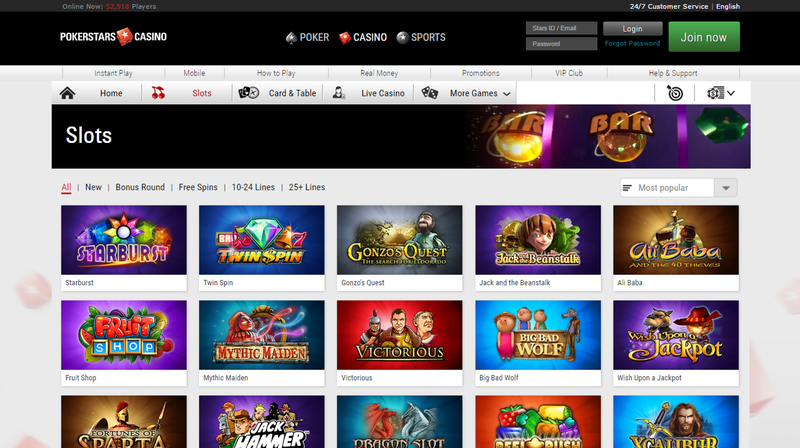 It makes use of the diverse nature of its gaming library effectively and offers up different deals based around them. The site is easy to navigate, too, with a crisp, efficient design that even the most rudimentary players can successfully make their way through. If we had one criticism about the design is that the colours are rather flat and a tad generic. When you think poker, the first colours that'll come to your head are red, black, white and green, and PokerStars loves making use of the first three of those. But does its content make up for this? The available games at PokerStars are predominantly virtual poker games, as it's quite clearly stated in the website's name. However, it strikes a perfect balance between this and the video slots and sports betting it also displays on its website. The slots they have include ones from NetEnt such as Gonzo's Quest, Starburst and Twin Spin. So it's all your favourites in one place! The games themselves perform well on mobile as well as PC but the fact you have to download a lot of other casino content makes the casino feel a bit empty. Downloading the program also takes up space on your device which isn't always a good thing. In fact, it's never a good thing. Still, the instant play option is available. You just won't get as much if you were to download the full version. For the bonuses and promotions at PokerStars, we must admit there isn't a lot of choice for instant play players. If you want a Live Dealer Ultimate Challenge or a Blackjack VIP prize card, then this is right up your alley. It can certainly accommodate those who want to play card games. For those slot players, though, all they've got to contend with is 200% Welcome Bonus. While this is a pretty hefty deal and can get a player a good head start with the site, it being the only thing that they can have is a little underwhelming and, we must say, we're not desperately impressed. Regardless, if you deposit more than £10, you'll get a 200% match. So for every £100 you deposit, you'll get £200 in return, giving you £300 to play with. You can do this up to a maximum deposit match of £400. There is, on the other hand, a VIP club scheme in which you earn enough Star Coins in exchange for certain prizes. You can get a head start by purchasing a thousand star coins for the PokerStars online shop. 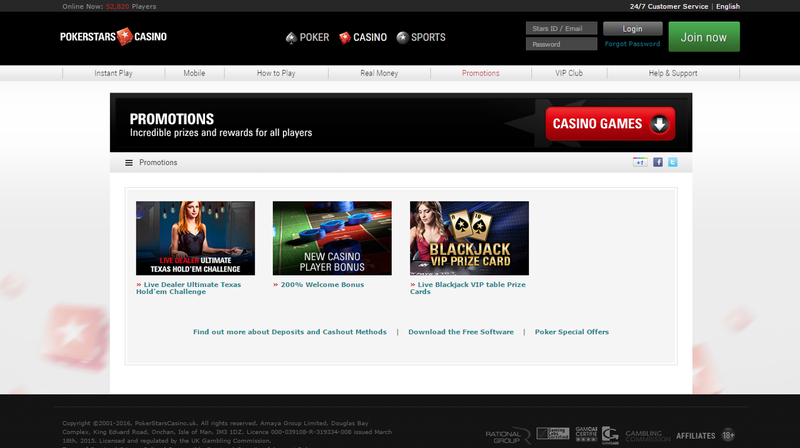 All the VIP seems to offer is different wagering requirements for all the table games available on the site. Not really much to get us excited, we must say. In the promotions department, PokerStars is severely lacking. We do wish they would release weekly promotion schemes to keep players interested. Otherwise, why bother returning to the site? It seems almost pointless. There are numerous methods players can use to make a deposit or withdrawal. This includes many e-wallets such as Skrill, Neteller and PayPal. But there are also options such as EntroPay, a local bank wire transfer, credit/debit card options and PaySafeCard. Poker Stars also provides a pay-by-phone-bill option for its mobile users which can used on all mobile network providers. PokerStars boats quick and easy cash-outs, making the process of getting your winnings a breeze. Players can also set their own deposit limit if they wish which can be sorted out on the ‘cashier' page. It's unfortunate that not all options do both withdrawals and deposits but sometimes that can't be helped. Customer service at PokerStars is pretty good. They have an online submission form that players can fill out if they need to get in contact with their support team. But they would hardly need it as there is helpful advice scattered all over the site which answers most questions that customers would have. In case you have a question that's more precise, however, there is a FAQ page which can be easily accessed from the homepage. Want to play at PokerStars? PokerStars strikes a perfect balance between the most common forms of online gambling! Claim 200% deposit bonus now! PokerStars So, to conclude, PokerStars is a well designed website that has an even more fulfilling downloadable package for PC players to use. The instant play feature, however, is still quite good and provides a wide variety of gambling -- a live casino as well as virtual table games, video slots and sports. Where it falls short is the promotion department. There really aren't that many to speak of. And it really is annoying that the full version of the website has to be downloaded, meaning it takes up space. It also doesn't make the casino incredibly mobile. While it's still competent, we feel there are some areas of improvement that can be found at PokerStars. Let's hope their large user-base feels the same.